By incorporating constituents of negative stiffness in structures and composites, one can attain extremely high values of mechanical damping, stiffness considered as a viscoelastic modulus, of thermal expansion, or of other physical properties. Negative stiffness is of itself usually unstable but can be stabilized by incorporation in heterogeneous structures or composites. Negative stiffness is associated with buckling on a macroscopic scale or on an interatomic scale associated with phase transformations. We have not called these metamaterials or architected materials. Lakes, R. S., "Extreme damping in compliant composites with a negative stiffness phase"
Philosophical Magazine Letters, 81, 95-100 (2001). Compliant composite unit cells were made with negative stiffness constituents. Flexible silicone rubber tubes were incorporated in a post-buckled condition to achieve tunable negative stiffness. Large peaks in mechanical damping tan delta were observed in these systems. Maximum damping was orders of magnitude in excess of the material damping of the silicone rubber. Download pdf from Phil. Mag. Letters, or from here. Negative Phase delta. Theory diagram: Reuss composite unit cell with negative stiffness phase. Physical Review Letters 86, 2897-2900, 26 March (2001). Composites with negative stiffness inclusions in a viscoelastic matrix are shown (theoretically) to have higher stiffness and mechanical damping tan delta than that of either constituent and exceeding conventional Hashin-Shtrikman bounds. The causal mechanism is a greater deformation in and near the inclusions than the composite as a whole. Though a block of negative stiffness (negative modulus) is unstable, negative stiffness inclusions in a composite can be stabilized by the surrounding matrix. Such inclusions may be made from single domains of ferroelastic material below its phase transition temperature or from pre-buckled lumped elements. Download pdf from Physical Review Letters, or from here. Nature, 410, 565-567, 29 March (2001). The force applied to deform an elastic object is in the same direction as the displacement: positive stiffness. The force direction is opposite for negative stiffness, possible if there is stored energy or a power source. Negative stiffness is not illegal; usually only unstable. Negative stiffness (negative modulus) differs from negative Poisson's ratio in which lateral expansion occurs upon stretching. Inclusions of negative stiffness can be stabilized in a composite by the surrounding matrix. Experimentally, composites were prepared with a dilute concentration of ferroelastic inclusions in a positive stiffness matrix to stabilize them. In a ferroelastic the free energy in the Landau theory has a relative maximum, corresponding to unstable equilibrium, below its transformation temperature Tc . The composites exhibited large peaks in mechanical damping (tan delta), and large anomalies in stiffness, in harmony with composite theory predictions. The inclusions are more effective than diamond in increasing the composite stiffness at selected temperatures. The underlying physical process is interplay between the positive and negative stiffness phases so that the inclusions deform more than the composite as a whole, giving rise to high local strains. Such composites may be useful as high performance damping materials, as stiff structural elements, or in actuators. Composites with inclusions of negative stiffness may be called exterlibral since they are on the boundary of balance, or archidynamic since they are based on initial force. They are pertinent to any heterogeneous material in which one constituent undergoes a phase transformation and another does not; also to some materials with a pre-strained constituent. Such composites may be of use as high-performance damping materials, since the figure of merit in the present results exceeds that of commonly used materials (E tan delta less than 0.6 GPa) by a factor of more than twenty. For that purpose, sensitivity to temperature could be reduced via matching inclusion and matrix stiffness. Bounds on properties of complex heterogeneous materials are generally derived assuming positive phase properties. These bounds can be exceeded if negative stiffness is allowed, permitting extreme properties not previously anticipated. Since in thermoelastic and piezoelectric materials, elasticity is coupled with temperature and electric field respectively, these composites may find use in high performance sensors and actuators. Experiment diagram. Composite with negative stiffness inclusions. Experimental torsional compliance and mechanical damping tan delta vs. temperature. Open triangles, a composite containing 1 % by volume vanadium dioxide particles in a tin matrix. Points, pure tin for which the damping tan delta = 0.019 over the temperature range considered. Measurements were conducted at 100 Hz, well below resonance, during slow cooling through the ferroelastic phase transition of the inclusions. Download pdf from Nature or from here. Wang, Y. C. and Lakes, R. S., "Extreme thermal expansion, piezoelectricity, and other coupled field properties in composites with a negative stiffness phase", Journal of Applied Physics, 90, 6458-6465, Dec. (2001). Particulate composites with negative stiffness inclusions in a viscoelastic matrix are shown to have higher thermal expansion than that of either constituent and exceeding conventional bounds. It is also shown theoretically that other extreme linear coupled field properties including piezoelectricity and pyroelectricity occur in layer- and fiber-type piezoelectric composites, due to negative inclusion stiffness effects. The causal mechanism is a greater deformation in and near the inclusions than the composite as a whole. A block of negative stiffness material is unstable, but negative stiffness inclusions in a composite can be stabilized by the surrounding matrix and can give rise to extreme viscoelastic effects in lumped and distributed composites. In contrast to prior proposed composites with unbounded thermal expansion, neither the assumptions of void spaces nor slip interfaces are required in the present analysis. J. Materials Science, 28, 4667-4672 (1993). J. Mechanics and Physics of Solids, 50, 979-1009 (2002). Composite materials of extremely high stiffness can be produced by employing one phase of negative stiffness. Negative stiffness entails a reversal of the usual codirectional relationship between force and displacement in deformed objects. Negative stiffness structures and materials are possible, but unstable by themselves. We argue here that composites made with a small volume fraction of negative-stiffness inclusions can be stable and can have overall stiffness far higher than that of either constituent. This high composite stiffness is demonstrated via several exact solutions within linearized and also fully nonlinear elasticity, and via the overall modulus tensor estimate of a variational principle valid in this case. We provide an initial discussion of stability, and adduce experimental results which show extreme composite behavior in selected viscoelastic systems under subresonant sinusoidal load. Viscoelasticity is known to expand the space of stability in some cases. We have not yet proved that purely elastic composite materials of the types proposed and analyzed in this paper will be stable under static load. The concept of negative stiffness inclusions is buttressed by recent experimental studies illustrating related phenomena within the elasticity and viscoelasticity contexts. Download pdf. Wang, Y. C. and Lakes, R. S., "Extreme stiffness systems due to negative stiffness elements", American J. of Physics, 72, Jan. (2004). Wang, Y. C., Ludwigson, M., and Lakes, R. S., "Deformation of extreme viscoelastic metals and composites", Materials Science and Engineering A, 370, 41-49, April (2004). Wang, Y. C. and Lakes, R. S., "Stable extremely-high-damping discrete viscoelastic systems due to negative stiffness elements", Applied Physics Letters, 84, 4451-4453 (2004). Wang, Y. C. and Lakes, R. S., "Stability of negative stiffness viscoelastic systems" , Quarterly of Applied Math., 63, 34-55, March (2005). Wang, Y. C. and Lakes, R. S., "Negative stiffness induced extreme viscoelastic mechanical properties: stability and dynamics", Philosophical Magazine, 35, 3785-3801, Dec. (2004). Wang, Y. C. and Lakes, R. S., "Two-dimensional viscoelastic discrete triangular system with negative-stiffness components", Philosophical Magazine Letters, 86, 99-112, (2006). Potential applications of high-damping and high-stiffness composites have motivated extensive research on the effects of negative stiffness inclusions on the overall properties of composites. Recent theoretical advances have been based on the Hashin Shtrikman composite models, one-dimensional discrete viscoelastic systems and a two-dimensional nested triangular viscoelastic network. In this paper, we further analyze the two-dimensional triangular structure containing pre-selected negative-stiffness components to study its underlying deformation mechanisms and stability. Major new findings are structure-deformation evolution with respect to the magnitude of negative stiffness under shear loading and the phenomena related to dissipation induced destabilization and inertia induced stabilization, according to Lyapunov stability analysis. The evolution shows strong correlations between stiffness anomalies and deformation modes. Our stability results reveal that stable damping peaks, i.e. stably extreme effective damping properties, are achievable under hydrostatic loading when the inertia is greater than a critical value. Moreover, destabilization induced by elemental damping is observed with the critical inertia. Regardless of elemental damping, when the inertia is less than the critical value, a weaker system instability is identified. pdf. Moore, B., Jaglinski, T., Stone, D. S., and Lakes, R. S., "Negative incremental bulk modulus in foams", Philosophical Magazine Letters, 86, 651-659, (2006). Negative compressibility is observed in foams under volumetric constraint. Pre-strain is applied. Negative incremental stiffness is known to occur in structures such as post-buckled flexible tubes and single cell models. A single foam cell under uniaxial loading buckles and exhibits a non-monotonic S-shaped deformation curve, which is indicative of negative incremental stiffness. Negative stiffness is not observed in materials, due to instability. For example, individual foam cells display negative stiffness but foams tested in uniaxial compression exhibit a plateau in the stress-strain curve because the buckled cells localise in bands. This behaviour is consistent with the continuum view in which strong ellipticity, hence positive shear modulus G and positive C11 modulus, are required for stability, even for a constrained object. It is hypothesised that a solid with negative bulk modulus can be stabilised by control of surface displacement. Experimentally, foams were hydrostatically compressed under control of volumetric deformation. Negative incremental bulk modulus was observed in foam with 0.4 mm cell size beyond about 20 percent volumetric strain. Foam with large cells 2.5 mm to 4 mm was anisotropic and did not exhibit the cell buckling required for negative modulus. get pdf. Jaglinski, T. M., Lakes, R. S., Negative stiffness and negative Poisson's ratio in materials which undergo a phase transformation, in Adaptive Structures: Engineering Applications, edited by D. Wagg, I. Bond, P. Weaver, M. Friswell, J. Wiley, Chichester, England, ch. 8, p. 231-246, (2007). get pdf. Shang, X. and Lakes, R. S., "Stability of elastic material with negative stiffness and negative Poisson's ratio", Physica Status Solidi (b), 244, 1008-1026 (2007). Cover article. Stability of cuboids and cylinders of an isotropic elastic material with negative stiffness under partial constraint is analyzed using an integral method and Rayleigh quotient. It is not necessary that the material exhibit a positive definite strain energy to be stable. The elastic object under partial constraint may have a negative bulk modulus K and yet be stable. A cylinder of arbitrary cross section with the lateral surface constrained and top and bottom planar surfaces is stable provided the shear modulus G > 0 and -G/3 < K < 0 or K > 0. get pdf. go-link. We show that composite materials can exhibit a viscoelastic (Young's) modulus far higher than that of either constituent. The modulus (but not strength) was observed to be substantially greater than that of diamond. These composites contain barium titanate inclusions, which undergo a volume change phase transformation if not constrained. In the composite the inclusions are partially constrained by the surrounding metal matrix. The constraint stabilizes the negative bulk modulus (inverse compressibility) of inclusions. The composites are stiffer than diamond over a narrow temperature range. 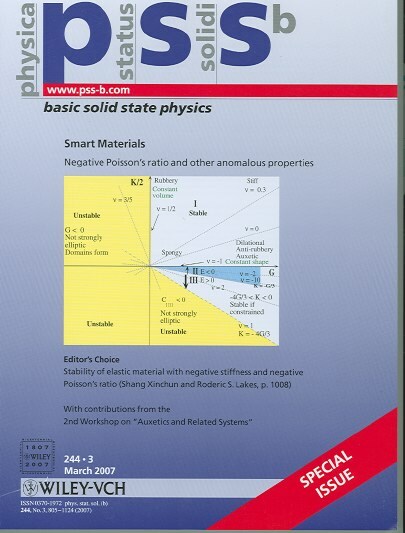 Dong, L. Stone, D. S., Lakes, R. S., "Softening of bulk modulus and negative Poisson's ratio in barium titanate ceramic near the Curie point", Philosophical Magazine Lett. 90, 23-33, Jan. (2010). Formal journal formatted reprints are available; if you want one, please request it. Get informal pdf. Substantial softening in the bulk modulus (a factor of five) and a negative Poisson ratio (-0.25) have been observed via broadband viscoelastic spectroscopy in the vicinity of the Curie point of a barium titanate ceramic. These effects were observed under electrical short-circuit conditions at low deformation frequencies. Softening was less in an electric open circuit or at higher frequencies. Softening of individual elastic modulus tensor elements is known to occur near phase transformations, but softening of the bulk modulus has not previously been well reported. Dong, L., Stone, D. S., and Lakes, R. S., "Sharp low frequency dissipative effects in tetragonal BaTiO3 ceramics,"J. Appl. Physics 107, 023514, (2010). get pdf. Copyright American Institute of Physics AIP link. Mechanical anomalies damping peaks sharper than Debye peaks, in contrast to a broad relaxation peak were observed in tetragonal barium titanate ceramic via broadband viscoelastic spectroscopy at low frequencies 10 Hz at ambient temperature after aging at 90 degrees C for 15 h. The sharp peaks disappear after aging above the Curie point 150 degrees C for 10 h. Mechanical anomalies are tentatively attributed to negative stiffness heterogeneity. Dong, L., Stone, D. S., and Lakes, R. S., "Anelastic anomalies and negative Poisson's ratio in tetragonal BaTiO3 ceramics", Applied Phys. Lett. 96, 141904 (2010). Anelastic anomalies, sharp variations in modulus and damping with temperature, were observed in tetragonal BaTiO3 via broadband viscoelastic spectroscopy after aging at 50 deg C for 15 h. The effect was most pronounced under electrical short circuit condition, at low frequency and under small excitation strain 10-6. Softening in bulk modulus and negative Poisson's ratio were observed near 60 deg C. Effects are attributed to an oxygen vacancy mechanism. A relaxational model cannot account for sharp response at smaller strains. Heterogeneity of negative stiffness is considered as a cause. Applied Physics Letters link. get pdf. Dong, L., Stone, D. S., and Lakes, R. S., "Dielectric and viscoelastic properties of KNbO3 doped BaTiO3", J. Appl. Phys., 109, 063531 (2011). Fine grain (1-2 micron) 2%, 3% KNbO3-BaTiO3 ceramics have been synthesized via the solid state reaction method. Fine and coarse grain ceramics sintered at different temperatures exhibit peaks in dielectric constant and internal friction in the vicinity of transition temperatures. Doping lowered the Curie point and raised the temperatures for the structural transformations between orthorhombic and rhombohedral symmetry and broadened the response near the transformations. Dielectric and viscoelastic responses sharpened with increasing sintering cycles. This effect is attributed to a reduced core-shell effect. Doped ceramic exhibited a relaxation peak due to oxygen vacancy with a similar activation energy and relaxation time as pure material. The steep increase in dielectric constant and internal friction in the ferroelectric phase and the reduced dielectric and mechanical anomaly in the vicinity of the transformations in the fine grain ceramics are attributed to the internal stress built up at the grain boundaries. Other possible mechanisms involved such as oxygen vacancy pinning effect, constrained negative stiffness 90 deg. domain bands and the liquid phase effect have also been discussed. get pdf, Journal link, this issue, Journal link, contents. Recently we develop high performance structural dampers based on negative stiffness. Dong, L., Stone, D. S., and Lakes, R. S., "Advanced damper with negative structural stiffness elements", Smart materials and structures, 21 07502 (2012). When a flexible flat-ends column is aligned in a post-buckled condition, a negative structural stiffness and large hysteresis (i.e., high damping) can be achieved provided the ends of the column undergo tilting from flat to edge contact. Stable axial dampers with initial modulus equivalent to that of the parent material and with enhanced damping were designed and built using constrained negative stiffness effects entailed by post-buckled press-fit flat-ends columns. get pdf. Kalathur, H. and Lakes, R. S., "Enhancement in piezoelectric sensitivity via negative structural stiffness" Journal of Intelligent Material Systems and Structures, 27(18) 2568-2573 (2016). Effective piezoelectric sensitivity of bimorph strip actuators was enhanced by negative structural stiffness. Negative stiffness was achieved in brass strips post-buckled in compression to an 'S' shape; the brass strip was placed in series with the bimorph. The negative stiffness was tuned by adjusting the brass strip length. The effective piezoelectric sensitivity in units of displacement per volt input, increased as the inverse of the overall stiffness of the series element. The maximum observed enhancement in effective piezoelectric sensitivity was at least a factor of six, at 1 Hz in comparison to the value when no negative stiffness was used. This corresponds to a maximum effective sensitivity of about 36 microns/V in comparison to the baseline effective sensitivity of about 6.1 microns/V, at 1 Hz. The value is several orders of magnitude (almost 40,000 times) higher than the typical value of sensitivity for the material comprising the individual bimorph strip actuator. Further lattices exhibiting negative stiffness snap through are in progress. The negative stiffness dampers based on our original negative stiffness concepts at top (2001) have been built upon, scaled up and used for applications. See this link. A related paper provides analysis of stability. This article discloses regions of negative stiffness in polymers via molecular modeling. Yoshimoto, K., Jain, T. S., Van Workum, K., Nealey, P. F., de Pablo, J. J., "Mechanical heterogeneities in model polymer glasses at small length scales", Physical Review Letters 93(17):175501, October 18, (2004). Drugan, W. J. "Two Exact Micromechanics-Based Nonlocal Constitutive Equations for Random Linear Elastic Composite Materials," Journal of the Mechanics and Physics of Solids, 51, 1745-1772, (2003). A Hashin-Shtrikman-Willis variational principle is employed to derive two exact micromechanics based nonlocal constitutive equations relating ensemble averages of stress and strain for two-phase and also many types of multi-phase random linear elastic composite materials. Download pdf. See also Prof. Walt Drugan's research page. Snap through. Illustration of instability. Illustration of Reuss model stabilized by displacement control by the hand of the demonstrator. The ring has positive stiffness and the pre-buckled column has negative stiffness. Observe how the ring deforms. First it deforms in compression as it is pressed indicating positive stiffness of the column. As the column is deformed into an S shape, the ring deforms in tension as it is pressed, showing the reversal of force associated with the negative structural stiffness of the column, so negative stiffness in the transverse direction. We thank the National Science Foundation, DARPA, and ARO for sponsorship of some this research. If you are interested in commercial applications, please contact the Wisconsin Alumni Research Foundation (WARF) for information on US and international patents and licensing. For current research reports, log in. This site is copyright, 2002 - 2019, Rod Lakes. All rights reserved. Follow-on research with advanced dampers may use key words such as force amplification, geometrical amplification, lattices with snap through elements, leaf springs, structural logic, material logic, structural logic unit. The subject is becoming increasingly popular. Many people call these metamaterials. This was originally suggested by V. G. Veselago, "The electrodynamics of substances with simultaneously negative values of e and m", Sov. Phys. Uspekhi 10, 509-514 (1968). G. Dolling, C. Enkrich, M.Wegener, C. M. Soukoulis, and S. Linden "Simultaneous Negative Phase and Group Velocity of Light in a Metamaterial", Science 12 May 2006: 892-894. G. M. Gehring, A. Schweinsberg, C. Barsi, N. Kostinski, and R. W. Boyd "Observation of Backward Pulse Propagation Through a Medium with a Negative Group Velocity" Science 12 May 2006: 895-897. A. N. Grigorenko, A. K. Geim, H. F. Gleeson, Y. Zhang, A. A. Firsov, I. Y. Khrushchev and J. Petrovic, "Nanofabricated media with negative permeability at visible frequencies," Nature 438, 335-338, 17 Nov. (2005). N. Fang, H. Lee, C. Sun, X. Zhang, "Sub-diffraction limited optical imaging with a silver superlens" Science 308: 534-537, (2005). S. Linden, C. Enkrich, M. Wegener, J. Zhou, T. Koschny, and C. M. Soukoulis, "Magnetic Response of Metamaterials at 100 Terahertz", Science 306: 1351-1353, (2004). J. B. Pendry, "A Chiral Route to Negative Refraction" Science, 306: 1353-1355, (2004). A. A. Houck, J. B. Brock, and I. L. Chuang, "Experimental Observations of a Left-Handed Material That Obeys Snell's Law", Phys. Rev. Lett. 90, 137401 (2003). R. A. Shelby, D. R. Smith, and S. Schultz, "Experimental Verification of a Negative Index of Refraction" Science 292, 77 (2001). J. B. Pendry, "Negative Refraction Makes a Perfect Lens" Phys. Rev. Lett. 85, 3966 (2000). M. Notomi, "Theory of light propagation in strongly modulated photonic crystals: Refractionlike behavior in the vicinity of the photonic band gap" Phys. Rev. B 62, 10 696 (2000). M. C. K. Wiltshire, J. B. Pendry, I. R. Young, D. J. Larkman, D. J. Gilderdale, and J. V. Hajnal, "Microstructured Magnetic Materials for RF Flux Guides in Magnetic Resonance Imaging" Science 291, 849 (2001). R. J. Blaikie and S. J. McNab, Microelectron. Eng. 61-2, 97 (2002). V. G. Veselago, Sov. Phys. Usp. 10, 509 (1968). R. A. Shelby, D. R. Smith, S. C. Nemat-Nasser, and S. Schultz, "Microwave transmission through a two-dimensional, isotropic, left-handed metamaterial" Appl. Phys. Lett. 78, 489 (2000). P. M. Valanju, R. M. Walser, and A. P. Valanju, "Wave Refraction in Negative-Index Media: Always Positive and Very Inhomogeneous" Phys. Rev. Lett. 88, 187401 (2002). N. Garcia and M. Nieto-Verperinas, Opt. Lett. 27, 885 (2002). N. Garcia and M. Nieto-Verperinas, "Left-Handed Materials Do Not Make a Perfect Lens" Phys. Rev. Lett. 88, 207403 (2002). D. R. Smith, S. Schultz, P. Markos, and C. M. Soukoulis, Phys. Rev. B 65, 195103 (2002). J. B. Pendry, A. J. Holden, W. J. Stewart, and I. Youngs, "Extremely Low Frequency Plasmons in Metallic Mesostructures" Phys. Rev. Lett. 76, 4773 (1996). D. R. Smith, W. J. Padilla, D. C. Vier, S. C. Nemat-Nasser, and S. Schultz, "Composite Medium with Simultaneously Negative Permeability and Permittivity" Phys. Rev. Lett. 84, 4184 (2000). Nicorovici, N. A. Mcphedran, R. C., Milton, G. W., "Optical and dielectric properties of partially resonant systems." Phys. Rev. B 49: 8479-8482. (1994). R. W. Ziolkowski and E. Heyman, "Wave propagation in media having negative permittivity and permeability" Phys. Rev. E 64, 056625 (2001).